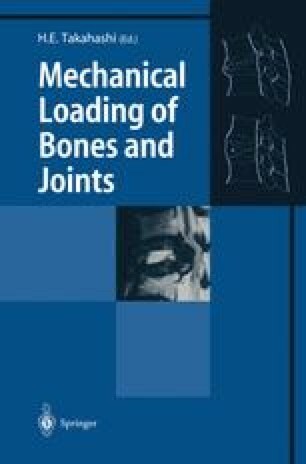 We report here the results of experiments using a 4-point bending device, and review earlier research into the relationship between bending stresses applied to the bone and bone response using this device. Twenty-four 6-month-old female Wistar rats (retired breeder) were randomly assigned to three experimental groups (n = 8/group) to which the following loads were applied: Group A, 25 N; Group B, 30 N; Group C, 35 N. A load was applied on the right tibia by 4-point bending. The tibia was loaded for 36 cycles at 2 Hz 3 days a week, for a total of 9 days with loading. In vivo strain on the lateral periosteal surface was 999, 1320, and 1726 µstrain in Group A, B, and C, respectively. On the lateral periosteal surface, bone formation significantly increased with the magnitude of force. Approximately 800 µstrain was the threshold value for lateral periosteal bone formation, and woven bone formation was observed on tibiae subjected to loads greater than 1500 µstrain.